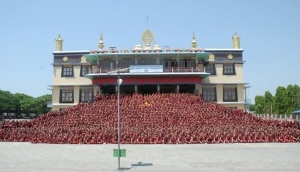 Lion’s Roar Dharma Center is associated with Sera Jey Monastery. 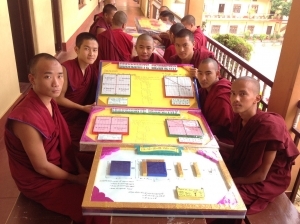 Our Teachers have studied or graduated from Sera Jey Monastic University. Sera Jey provides the Buddhist community with an academic institution granting degrees in Buddhist studies, a retreat center, a secondary school, and a cultural center. Sera Jey Monastery was founded in Tibet in the 15th century. Due to the Chinese invasion and occupation of Tibet in the middle of the last century, Sera Jey Monastery has relocated to Southern India. The Abbot and Senior Teachers from Sera Jey Monastery regularly visit Lion’s Roar Dharma Center to teach and offer guidance. Lion’s Roar Dharma Center and its members support the Monastery through our contributions that go toward maintaining their programs, feeding and housing the monastics, and helping with travel. We are extremely grateful and honored to be associated with Sera Jey Monastery and benefit from its teachers and traditions.